Macclesfield Town asked me to answer some questions for their programme on Saturday. If you travel up there- and the coach details are below- you will undoubtedly get to see it in all it’s glory, but having gone to the trouble of writing it I thought I’d share it with you here! But first, travel! Saturday is now crucial. We’re still in the promotion shake up having played all of our rivals, and now we’ll leave them to play each other whilst we beat everyone else! Seriously, we need three points on Saturday, and the best way to help the team get them is to be there and give them your support. You never know, we may even have a new striker to cheer. Coaches will leave the Broadfield Stadium at 8AM, and the cost of travel is £20 for members, £25 for non members. Please book early if you can, as we need to finalise coach numbers. Now, on to the programme piece. Hope you enjoy! What are your thoughts on the season so far? Given that this is our first ever season in the Football League, I can’t be anything other than delighted with our progress. During pre-season a number of football magazines asked me what I would class as success, and I replied that I’d be happy with mid table security so long as we were above Aldershot and AFC Wimbledon! That still stands. But I expect to do significantly better than that- we will be up around the promotion and play off positions come May. Can you explain what a whirlwind the last few years have been from being on the brink of liquidation to now? We’ve just sold two players for a combined total in excess of two million pounds. We’ve a new stand going up shortly. We’ve outplayed Manchester United at Old Trafford, knocked Derby, Hull and Bristol City out of the FA Cup, won promotion with a record number of points, increased our crowds five fold. Whirlwind doesn’t do it justice. But at the risk of offending a few CTFC fans with very short memories, the best thing about the last few years has been financial security. We have owners who are making sensible, long term decisions, we’re well organised behind the scenes, we have the best team we’ve ever had. I remember only too well being ten minutes from going bust and our club being owned by a couple of very dubious characters who were rushing us headlong towards oblivion. Those memories may be fading, but they will never, ever, be forgotten. How much of a miss will ex-Macclesfield favourite Tyrone Barnett and Matt Tubbs be? A month ago we had the best forward line in the division. Now we haven’t- although I’m sure the manager is working hard on putting that right! It would be impossible not to miss two players as good as that. Tyrone, particularly, was for me the best player ever to pull on a Crawley shirt- good in the air, good with the ball at his feet, tirelessly working hard at all ends of the pitch. I’ve no doubt he’ll be a massive success at Peterborough. But that said, I still support the decision to sell them. Matty wanted to go to his hometown club. Tyrone wanted a chance at a higher level. We made a combined profit of over two million pounds. How can a club in League Two with average crowds of three and a half thousand turn down that sort of money? I’m sure it will be reinvested wisely. Although it’s been an excellent first season in the Football League, have their transfers ultimately impacted on the recent form? Absolutely- though it must be said that Tyrone had undoubtedly been affected by the speculation. Our team was set up to play to the strengths of our two forwards. Suddenly they aren’t there, we’ve had new players come in, and it’s almost like we’re trying to restructure our playing style. But Billy Clarke looks an exceptional signing. That said, I think the return to Ipswich of Andy Drury and injuries to Scott Shearer and David Hunt have probably had almost as much of an impact on recent form as the departure of Tubbs and Barnett. Onto off-field matters now and are the fans concerned about whether a club of your size can sustain the amount of money which has been spent over the past two seasons? Firstly, I would like to say that accounts of our largess have been greatly exaggerated. Some of the fees mentioned in the press have been quite laughable. Yes, we’ve spent money, but we’ve made a great deal more on the back of this investment. However, if you were to take a look at our team, the vast majority of it cost us absolutely nothing. That said, we need to continue to grow our fan base. Crawley Town has always been a non league club. It’s also a town that sends supporters to watch the London Premier League giants, and much of its population came from London originally and as such already has loyalties towards other teams. Our job is both to persuade these supporters that they should watch us when their teams are away -or as a much cheaper alternative to their teams- and to build up support amongst the young people in the area. The time to get them hooked on CTFC is when they’re young- loyalties are built at an early age! We’ve made great strides, but their is still much to do. How much of a help has the last two FA Cup campaigns been for the revenue streams? A massive help. We’ve made a lot of money from the FA Cup and had a wonderful time too! But it’s being reinvested wisely- much of last seasons FA Cup profits will go into the new stand, for example. Although we can’t budget based on FA Cup glory- until last season we hadn’t won a single FA Cup game in years! Do you think the cup runs will allow funds to be released to help Steve Evans build the squad for next season? The club was already financially secure, but also financially prudent. Steve can undoubtedly spend where he needs to spend, but he isn’t daft and the board isn’t daft. We won’t spend silly money on mediocrity. Finally, a score prediction: If we can turn possession and chances into goals, I would predict a 2-1 Crawley victory. If we can’t, a no score draw. 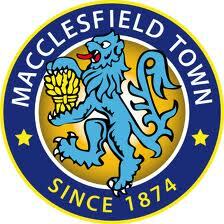 Best of luck to Macclesfield for the rest of the season! Political party? On ballot papers I write “none of the above”!